Change always comes bearing gifts. When you opt for a ketogenic lifestyle, these offerings are vigor, cheerfulness, mental clarity and the rest of a long and wonderful list. However, this keto-transition might also cause some side effects. They are usually temporary and cause very little inconvenience. One of the most infrequent among all of them is a skin disease called keto rash. This rash might become quite a nuisance if it occurs. Itchiness, peeling, frightening appearance, ick! But don’t take it hard, it’s both curable and preventable. By learning the science behind it, you might significantly reduce the risk of getting this unwelcome keto rash. Keto Rash: Is Ketosis a Cause? The genesis of keto rash is still unknown, but some evidence is available. Many keto proponents assert that keto rash is scientifically known as prurigo pigmentosa (PP). Currently there’s not enough scientific data to unanimously equate keto rash with PP. Taking everything science knows into account, it might be reasonable to consider keto rash as a case of prurigo pigmentosa. However, not every instance of prurigo pigmentosa has a ketogenic origin. Within this article, the keto rash and prurigo pigmentosa are used as synonyms to simplify reading. What Does Science Know About Prurigo Pigmentosa? It was initially characterized in Japan by Masaji Nagashima et al. in 1971, and a formal term was coined in 1978. Though it may sound as if Lord Voldemort is casting one of his deadly spells, prurigo pigmentosa is far behind in terms of destructive effect. Diving further into science, probably the most extensive paper available on this rash is a retrospective study, published in the Journal of Dermatology, which analyzed 50 particular cases of PP. Patient’s mean age at diagnosis was about 23.7 years and varied from 15 to 61. There were 36 women out of 50 patients, and 27 of those 50 patients had experienced PP before. Itchiness. Of the 50 patients, 48 reported itchiness and nearly half of them claimed it to be moderate or severe and to impair both their sleep and daily life. 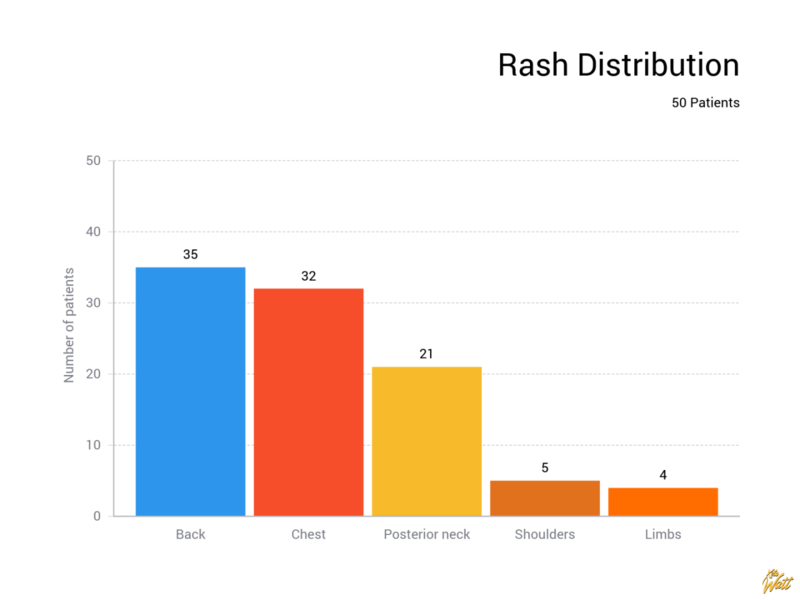 More than 90% of patients had the rash spread equally on both sides of their body. 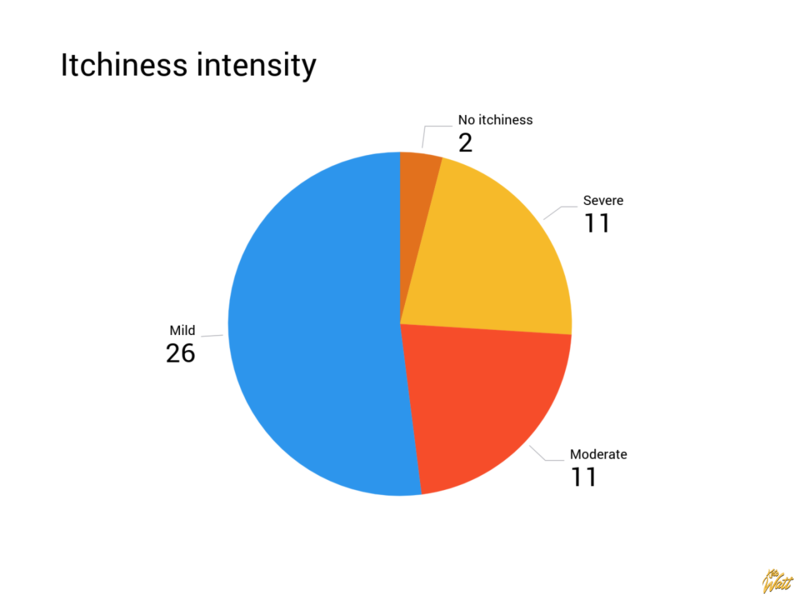 Back and chest were the most typical places, the neck was a bit less frequent, and both shoulders and extremities were reported only in about 10% of cases. Early lesions. Usually pinkish pruritic bumps or papules. It normally takes them 2–3 days to develop up to the next stage. If you’re facing a keto rash, this is the best moment to start treatment. Fully-developed lesions. Very itchy red bumps filled with small amount of liquid or pus. This stage usually lasts for about a week. Late lesions. When the rash retreats, reticulated brownish spots are left on top of the skin. These maculae usually persist for several months and will eventually go away when the keto rash is healed. Although, if a factor which caused this rash isn’t cured, new lesions might come across. Recurrent lesions. New papules appear on top of late lesions, rash gets darker and more saturated and might also be covered with crust and scales. Adding fuel to the fire once again — despite several studies showing a connection between ketosis and prurigo pigmentosa, its etiology is yet unknown. Everything said below is a summary of both scientific evidence and people’s experience. That’s not enough to call the keto rash a clear case but clarifies it to a certain degree. 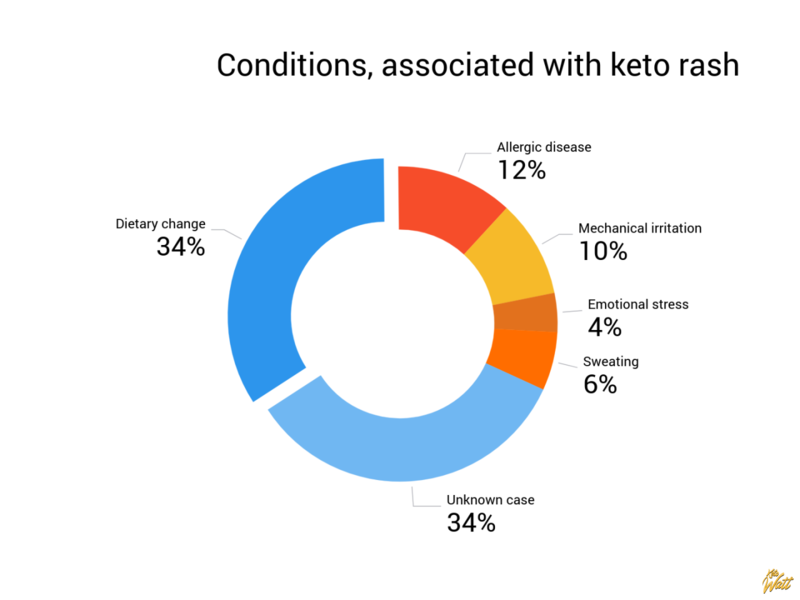 Prurigo pigmentosa studies showed that quite a few patients were in ketosis or had lifestyles that contributed to ketone production (e.g., fasting, strong dieting or low-carb eating), while the rest of them weren’t. Therefore, it makes sense to consider keto-based and non-keto based causes of the rash separately. One thing is clear about starting a keto diet — with a shift from eating regular carbs towards eating a significantly smaller amount – it changes the way your body handles the food. Your body starts to produce more ketones, and in order to do that it needs to adjust the digestive system to handle the increased amount of fat. Acetone. In ketosis fats are broken down into ketones, including acetone, which is useless for your body. It excretes excessive acetone through sweat, irritating your skin. That might explain why keto rash often appears in those areas where sweat accumulates the most. Considering that acetone concentration is significantly increased during the keto-adaptation period, it’s reasonable to take the “acetone causes keto rash” hypothesis into account. Toxins. Unfortunately, fats aren’t only a great source of energy, but also a place where toxins accumulate. During a state of ketosis you start burning stored fats at high gear, and your liver might not be able to process those stored toxins efficiently. As a result, they get into the bloodstream and might eventually be disposed of through sweating. Here comes the same logical chain as in the acetone section, which makes this hypothesis viable. Gut bacteria disbalance. Scientifically called dysbiosis, it correlates with skin lesions like acne, eczema, and others. A ketogenic diet causes a shift in gut bacteria, which might irritate your digestive system and cause a temporary rash. Bile issues. A contributor rather than a standalone factor, and yet is worth mentioning. You need bile to digest fats, it is produced by the liver and is stored in the gallbladder. Some people might have a weak bile flow, resulting in an increased bile concentration in a gallbladder, which in turn leads to a rise of lysophosphatidic acid. This acid mediates in a number of processes and is a potent neuronal activator, which might promote skin itchiness. Candida. This fungus is quite common and is present in a significant number of people around the world. It is usually kept low by the immune system and doesn’t cause inconvenience. The candida yeast thrives on glucose and might become extinct when you all of a sudden switch to ketosis. In that case, the rash might be a reaction to an increase in toxins as candida passes away. These are the known and potential triggers of a keto rash caused by a transition to a keto diet. There’re still some triggers which aren’t caused by ketosis directly but can be associated with it as well. Emotional stress. In the previously described study, 2 out of 50 patients had PP relapsed after experiencing great stress. Mechanical skin irritation. Garment friction, bandage rubbing or body scrubbing caused a rash to recur in 5 of 50 cases. Sweating. Three persons reported PP recrudesced after perspiration during a workout or just after everyday sweating. Altering a diet. Of 50 patients 17 were unlucky to experience a rash after making dietary changes, including low-carb intake and predominant single meal consumption, such as boiled eggs or cucumbers. All of them reported that the rash declined as soon as they stopped dieting. PP came back in 5 of those patients with diet resumption. Lack of nutrients. Elimination diets without additional supplements might contribute to a lack of certain vitamins (A, B2, niacin or B3, C, K), which may induce a rash. Allergy. Rare but as well scientifically reported case. Six patients reported different allergic diseases, including metal allergy, atopic dermatitis and allergic rhinitis, which might be associated with prurigo pigmentosa. In another study, this rash was thought to appear due to allergy to chemicals like chrome and para-amino compounds. This list is not exhaustive and will probably be updated as science goes more in-depth into the keto rash’s genesis. The best cure for insomnia is to get a lot of sleep. Just a joke, but many a true word is spoken in jest. Unless the keto rash origin is unanimously determined, any provided treatment is just an attempt to abate the symptoms. The best case scenario. Follow your everyday routine, and the rash will eventually go away. If a transition to a ketogenic lifestyle caused it, there’s a certain chance that the rash will vanish as soon as your body has adapted to its new conditions. Although it may sound untrustworthy, at least one study described it actually works. Three patients had the rash sorted out spontaneously within several weeks. Many people reported that eating additional carbohydrates improved their rash. It might increase insulin levels and also kick you out of ketosis, so it’s for you to decide whether it’s worth trying. Increase carb intake to make sure you leave a ketosis state. Observe your rash for several days. If it gets better, ketosis could be the cause. Gradually start to decrease carbs consumption aiming to get back into ketosis. If you find that rash relapses, it might be a sign that you’re sensitive to ketones. Although, It’s possible that keto rash won’t recur if you find your optimal carbs intake. For example, if you used to eat 20–30g of carbs per day and now consume 50g, you might still be able to get into ketosis and reduce the rash symptoms. Sometimes it might be reasonable to try a fasting pattern, which allows you to combine specific ketosis state’s benefits and eating extra carbs within a day. Overall, it varies from person to person, and you might give each option a try to see if one helps. A ketogenic diet may bring a variety of new products to your table and also increase the amount of certain foods you consume. For instance, some people drastically increase their egg consumption, others go for excessive amounts of dairy, nuts or vegetables. If you find that your daily eating routine had a significant shift, try temporary eliminating certain foods which are new or excessive. Given the fact that acetone and toxins excreted through sweat might be triggering a keto rash, it’s reasonable to avoid excessive sweating. Of course, it’s nearly impossible to completely keep away from sweating in everyday life, especially if you like working out. Therefore it might be rational to pay extra attention to hygiene factors, for example, wipe the sweat with a towel during physical activities and take additional showers throughout the day. Taking care of skin irritation might help as well. Do not mechanically irritate your skin, that means no scratching, bath scrubbing, vigorous towel rubbing, bandaging and anything like that. A lack of essential nutrients causes a large number of diseases. Replenishing minerals and vitamins is especially vital during many types of elimination diets, where keto might belong because it excludes a vast amount of certain foods. Each nutrient is important, but vitamin A is one of the most vital nutrients regarding overall skin health. The best keto-friendly sources of this nutrient are kale, spinach, broccoli, egg yolks, and beef liver. Pay attention that plant sources and animal sources of vitamin A are different regarding their ability to be utilized by your body, that’s why the best option is to combine them. A lot of people report that many physicians are unaware of the keto rash and mistake it for other skin diseases, and thus provide inappropriate treatment. That’s why it might be smart to preemptively collect information about medications for prurigo pigmentosa and facilitate your physician’s job. Doxycycline. An oral dosage of 200mg a day for one month showed its therapeutic effect. Minocycline. A daily dosage of 100–200mg was efficient in the suppression of new rash appearance. Dapsone. Daily oral intake of 100mg showed a significant improvement in a current rash. The paper suggested that minocycline is preferred in comparison to dapsone because of fewer side-effects. This study tested 400mg of clarithromycin and 300mg of roxithromycin daily and suggested that both of them removed keto rash symptoms and thus they might be considered as a possible treatment for prurigo pigmentosa. The therapeutic effect of these antibiotics is thought to be due to their anti-inflammatory impact rather than anti-microbial action, and they also don’t protect you from rash recurrence as soon as you stop therapy. That’s why they are only useful to get rid of rash appearance temporarily, but not to solve the underlying issue. “An ounce of prevention is worth a pound of cure.”, said Benjamin Franklin. Unfortunately, even the ultimate collection of this noble sir’s portraits can’t ensure that rash won’t appear. Luckily, there’s still something you can do that doesn’t cost a fortune. The best tactic is born of common sense — be proactive. You know a ketogenic diet might cause a shortage of minerals and vitamins, so balance your daily foods and use additional supplements if needed before this deficiency has a chance to happen. Don’t dive into ketosis if you’re new to the field, approach gradually and avoid excessive stress. One more thing about “do nothing” suggestion in the previous section. Following it to prevent the rash might not work. If you eventually find pinkish, itchy areas on your skin, it might be reasonable to switch over to another treatment right away. Just to make sure this rash doesn’t stand a chance of developing any further. Statistically, the chances you would get a keto rash are quite low, but it’s still best to prevent this issue. Being proactive will give you an advantage in avoiding keto rash. Of all keto-related side effects, the keto rash is probably the most unappealing and inconvenient. Not being able to figure out its exact cause is quite a significant aggravation as well. Step into ketosis slowly. The key is to train your body to run on fats and avoid stress to the maximum. Keep in mind that sometimes taking a step back is a way to make two steps forward. Improve your diet. Analyze what each particular food brings to the table in terms of its nutrition and create the best meal plan which covers your requirements and is easy to follow for you. You might be surprised how varied a diet might be while still being ketogenic. Pay extra attention to hygiene. During ketosis, especially the adaptation period, acetone concentration in your sweat might be significantly increased. Don’t let it stay on top of your skin for prolonged periods of time and irritate your dermis. One more factor to take into account is stress. It literally makes everything worse and sometimes may be an only cause of disease. Easier said than done, try to be positive and avoid possible tension. Life isn’t black and white, and keto rash isn’t the end of the world. If it suddenly comes up, fight it down with those tips and ideas you’ve learned. A ketogenic lifestyle is great, and no rash could have an opportunity to darken its benefits.